Formerly red-hot bitcoin has seen a large drop from its record highs reached in December. 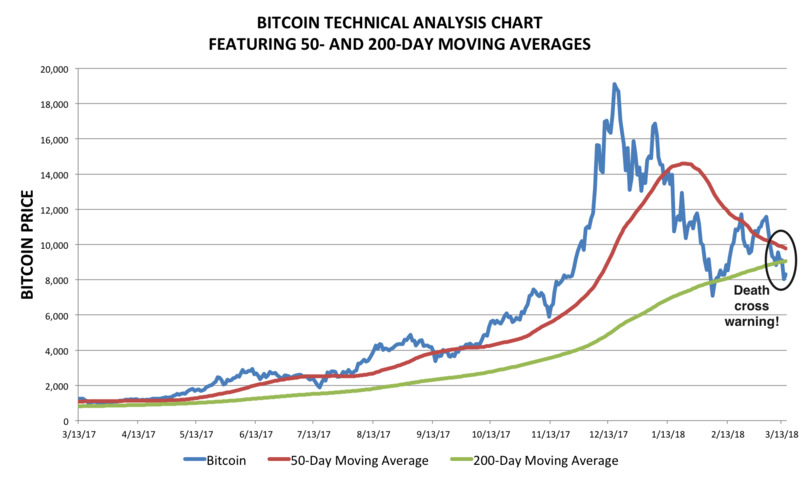 The digital coin looks poised to trigger a bearish technical indicator known as a “death cross,” which portends more selling to come. Goldman Sachs said earlier this week that bitcoin is at risk of taking out its February lows. Bitcoin is flirting with disaster. 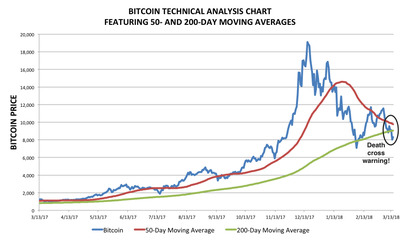 Now before you run off and sell all of your bitcoin, note that technical analysis like this is intended to be used as complementary. Few traders make decisions based solely off technicals, while wise ones use it as one piece of a bigger investment puzzle. This bearish signal on bitcoin matches a forecast made by Goldman Sachs on March 11. The technical analysis team led by Sheba Jafari warned further selling is on the horizon, citing the February low of $US5,922 as potentially in jeopardy. And while bitcoin hasn’t yet re-tested those lows, the seemingly imminent death cross may give more technically-inclined investors reason enough to push it that far.